When you mention Vietnam, everyone can recall its recent violent history and it’s easy to forget that the country has a history beyond that. Vietnam is full of ancient architecture, wonderful food and exciting nightlife. Not to mention some of the world’s most preserved natural wonders that no twentieth century war can ever take away. In Vietnam, I learned a lot from the people I met (locals and travellers alike) and the places I visited. Here are just a few! 1. The traffic is a healthy reminder of your own mortality. 2. The women are the uncelebrated cornerstone of Vietnam’s culture and economy. After spending time travelling from north to south, it is clear that women play an important role in the political economy as well as cultural preservation. The Vietnamese Women’s Museum in Hanoi highlights the integral role they play in agricultural infrastructure. From rice fields to market stalls, many of the food related land labourers seem to be women. It comes as no surprise that women are very rarely seen in positions of political power in any country, let alone Vietnam. Yet in the Highlands, communities like the Ede, Mnong and Jarai still follow matrilineal traditions. The oldest woman in the family has the most importance in governing domestic affairs and while all children are precious, girls are favoured within these societies. It is not uncommon in these areas to hear of husbands moving in to the wife’s family home: a concept that may seem unfathomable to some other cultures. 3. An abundance of green does wonders for you. There is a reason why nature is referred to as Mother in every language. If you live in a dense city and work in busy, built up areas like I do, it’s very easy to alienate yourself from the natural landscape entirely. I’m sure there are studies out there that prove that bright colours and fresh air helps to combat depression but I don’t need a scientist to tell me that lush green fields and fresh food is good for the health. I’m not unlike some of the kids I teach, who don’t know that chips are made from potatoes! Having never been to Bangladesh, I’ve never seen what rice looks like before it’s harvested and it stressed the action I need to take to know where my food comes from. Halong Bay is just as picturesque as the internet suggests, if not more. An entire spectrum of blue transforms into ripples of gold during sunset. I've not experienced anything quite like it. I wish I could say that Vietnam, with its diverse ecology and landscape, is pure and untouched by pollution. Sure, the Mekong Delta is mostly clean (the murky colour comes from algae not grime) and for the vast majority of its rice fields and mountains, it is. But while floating through Halong Bay on a perfectly still evening, the odd plastic bottle or tattered Lidl bag will definitely pass your boat. These little pieces of rubbish have never seemed more like monstrosities than while being fished out by the floating villagers of Cua Van, to whom Halong Bay is known as home. I know that like me, many others who slept overnight in Halong Bay were faced with the alarming reality of global refuse and left very much conscious of the consequence of mass production and consumption on environments that were millions of miles from us. 5. Food here doesn’t just consist of pho and banh mi. I know we all know this, but Vietnamese cuisine has more to offer than the dishes that managed to become famous in the West. The southern region, with its warmer climate, bears more tropical fruit than you can imagine! Ripe rambutan, sharp kumquats and bulging masses of jackfruit are all imported from regions beyond Ho Chi Minh and sold in more hilly areas past Hanoi. In order to find out more about traditional Vietnamese cuisine, I booked myself in for a cooking class at Giaon Cooking School. It was exciting learning how easy it is to make dishes like pho, tuna grilled in banana leaf and caramelised eggplant. I definitely had a lot more appreciation for these dishes after having made it myself! I was also under the impression that Vietnam had only pork to offer. How wrong was I! One of the most affordable but delicious dishes I had while in Vietnam has to be the deep fried red snapper or elephant’s ear fish with mango and papaya salad. It may even beat the Bengali rupchanda (Pomfret) in terms of looks too! 6. This is probably as close to Bangladesh as I’ve ever been. As I mentioned, I’ve never been to Bangladesh as an adult so I can’t speak much to the reality but what made me feel this uncanny sense of belonging was the traditional culture. On special occasions like weddings, women would often wear fitted embroidered dresses like a salwar kameez. Bitter gourd (karela) is disliked by the young and eaten mostly by the old for its cholesterol lowering properties. 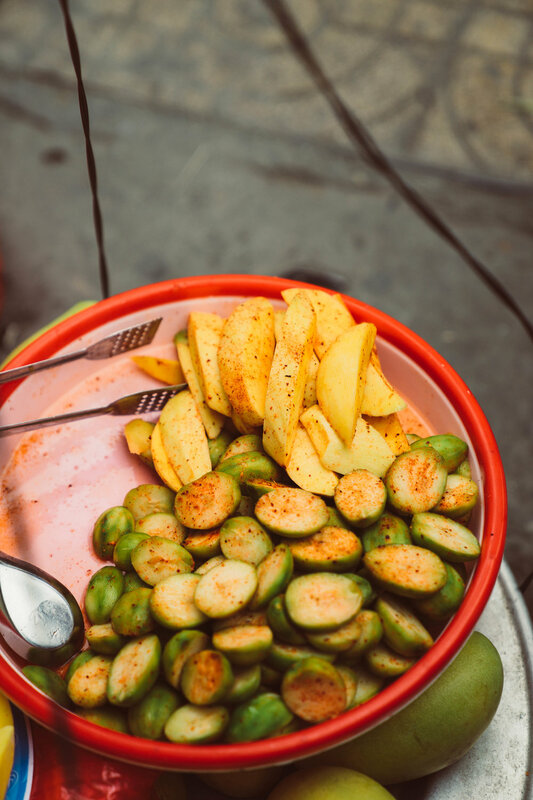 Fried fish is a delicacy and people here love raw mango and papaya spiced with chilli as much as any Bengali. The fierce sense of nationalist pride often masks the desire for capital success in the West just as much as Bangladesh. In some ways, I had the advantage over a lot of tourists visiting who couldn’t imagine what village life would be like. I at least had my grandmother hammering the message that the simpler times are often the happiest! 7. The best thing about a country is it’s people. Vietnam is probably one of the countries I’ve travelled to where I didn’t feel worried about my safety (just my sense of direction!) If you’re staying in Ho Chi Minh and find yourself outside the tourist zone of District One, you’ll find that locals are very helpful and often provide hidden gems to visit. 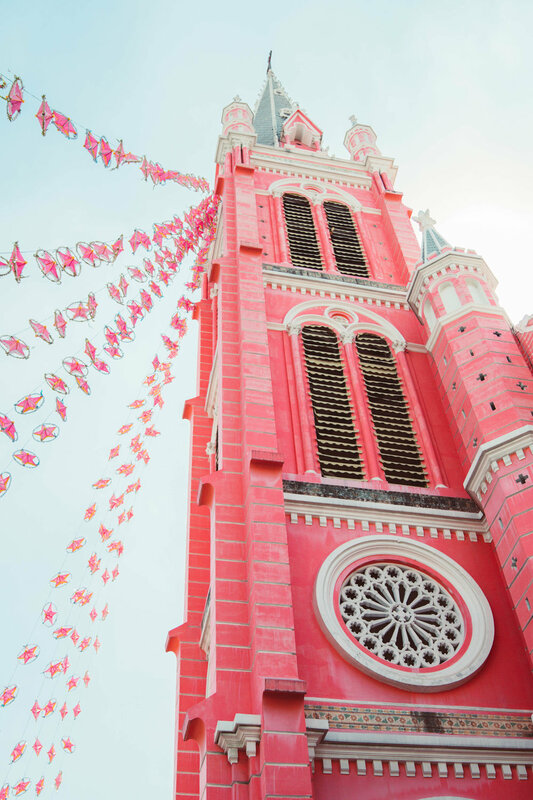 For example, while grabbing brunch at Vintage Emporium, the waitress recommended a route that allowed me to discover two of Ho Chi Minh’s most beautiful religious sites: the Jade Emperor Pagoda and the bubblegum pink Tan Dinh parish church. It is a bit of a journey out of District 1 but well worth the visit! 8. Preserving cultural history is important. I love travelling to countries where history overpowers your senses. The faded colonial walls that were once mustard yellow and the compulsory baguettes with every meal told me more about Vietnam’s heritage than any museum could. Although if you’re looking for well curated exhibitions, I would recommend the War Remnants Museum; the Vietnamese Women’s Museum and this photography exhibition by Rehahn. 9. If you didn’t drink coffee before Vietnam, you sure as hell will afterwards! Prior to visiting Vietnam, I thought coffee was akin to consuming petrol. No amount of latte art could convince me otherwise. Now after having the famous egg coffee and Vietnamese coffee with condensed milk, I am transformed. So what if these drinks are more pudding like than coffee? It agrees with me! In general the Vietnamese have managed to nail the shabby-modern balance in a cafe menu and decor in a way that Shoreditch hipsters could only dream of, but more on that in another post. 10. Travelling is more than a financial investment, but it helps when countries don’t break the bank. Travelling is expensive. Especially if you’re a teacher like me and can only go away during peak seasons. Bearing that in mind, Vietnam was a lot kinder to my bank balance than any other destination I’ve been to. You can spend £15 for two people in very nice restaurants. There is no real public transport system that a foreigner can fathom so other than walking, taxis in Vietnam are your best bet. These don’t cost more than £3-4 for a 30 minute ride into the centre. In Hanoi, the trustworthy companies have white cars and red stripes whereas Ho Chi Minh has Vinasun, again white cars with red and green stripes. While there, I didn’t have any negative experience using taxis but I do need to emphasise: only trust taxis where the driver’s ID is displayed and there is a meter. Generally, Vietnam is cost effective and that made the entire trip a whole lot more fun and adventurous than I’d planned!